Today was another lovely day in the DC area. It was increadibly hard to be inside all day for meetings and a conference, but at least the mandatory conference I went to was really good. Once a year, one of the county agencies that school personnel makes referrals to has a big policy update conference that school social workers have to attend. Last year this conference was an all day horrible bore of an affair. They speaker they brought preached that their model of intervening with at risk kids was best, but did not speak to making their model feasible in a Very large community. Their model was successful in a small rural community where each case manager had a case load of like four or five kids. If only!! This year, we had to go through the standard bore of updating things like fiscal policy and referral process changes, but then they had a speaker who addressed issues of taking care of the caregivers and anger management. Not only did he present some very thoughtful information on both topics, but he was dynamic, engaging and extremely humourous. It was nice to leave the conference at noon with some new thoughts on how to address my angry little first grade student next week when I see him. 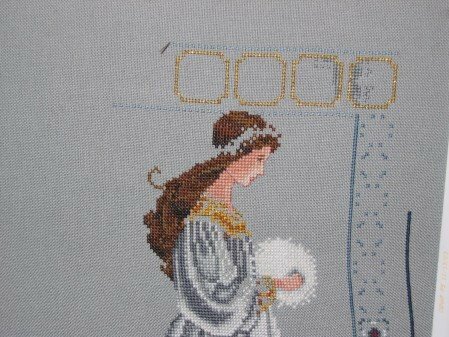 Tonight, I plan on being good and pulling out white wedding and stitching a bit on my RR. I figure if I put a thread or two into my RR a night, I will easily have it done by the June 15 deadline. Tomorrow, I have to get some cleaning done in our master bedroom as the painters are finally coming on Monday. It will be so nice to have that done. Then it is off to have my hair highlighted before my sisters wedding (one week left:)) and then time to put some good stitching into Mystery 9. If I can get part 5 mostly done tomorrow, I will have all of Memorial day weekend to work on other stuff:) Sunday, I would like to work a bit on my lilies and pick a piece to stitch for Melanie, my partner in the Friendship Exchange. Celtic Winter looks just beautiful!! !